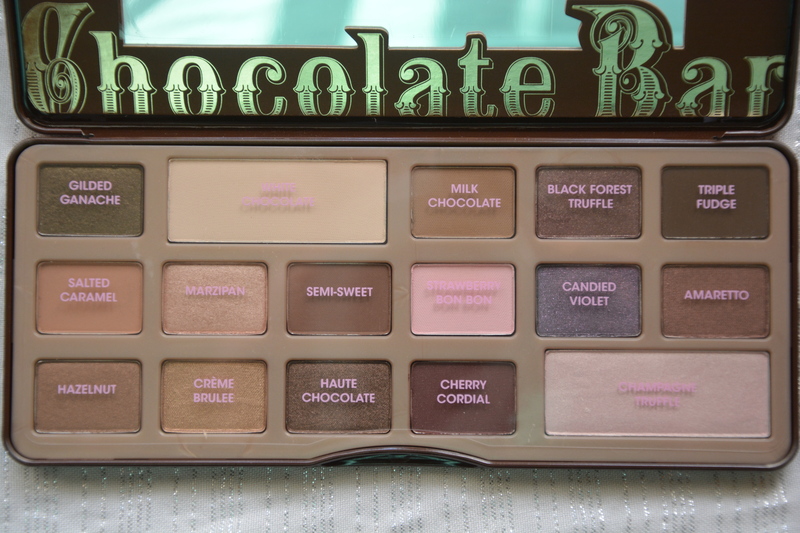 I have been using the Too Faced Chocolate Bar Palette for two weeks now so I think I am ready to give my opinion on it. 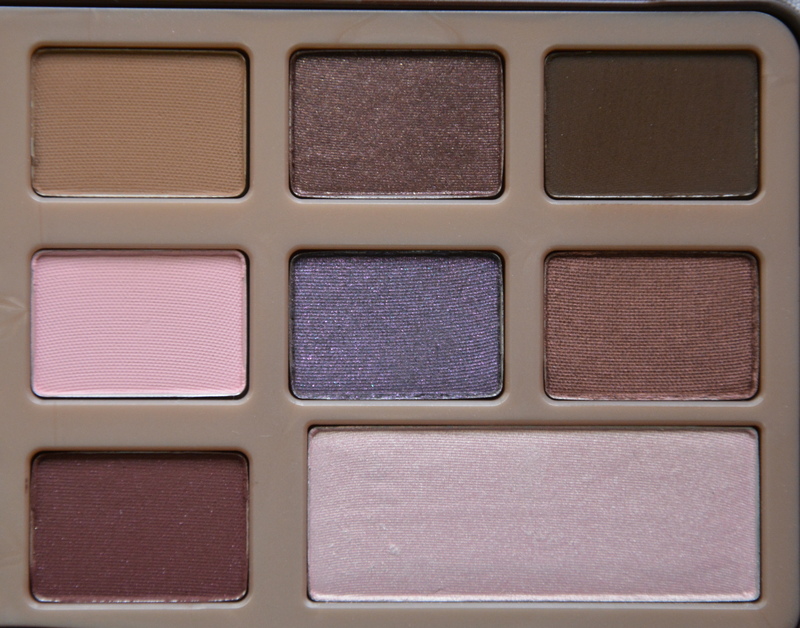 I don’t know why I left it so long to get this palette – probably because I have lots of other neutral eye palettes – because it has become one of my favourites. Firstly I love the packaging, a metal tin with a magnetic closure, which isn’t overly bulky so would be easy to travel with. Secondly the quality and colours of the eyeshadows is outstanding, there is not one dud on the whole palette. Finally, the smell of the eyeshadows is intoxicating. They are made with real cocoa powder, so as soon as you open the palette there is the lovely aroma of chocolate that isn’t too overpowering but it is definitely strong. Inside the palette is a clear plastic sheet with the names of the eyeshadows, I think I would have preferred the names to be printed on the eyeshadow surround as I prefer to discard these sheets. But this is definitely not a deal breaker. There is also a small mirror in the lid but I tend not to use this, if you were travelling with the palette though this could come in handy. Lets look at the actual shadows now. They are all named after chocolates and sweets and I think Too Faced did such a good job with the names. All of the eye shadows are smooth, buttery and nicely pigmented, some more than others though. Gilded Ganache is a dark neutral brown with fine golden shimmers running through it. The shimmers stick to the skin well so do not cause any fall out. White Chocolate is a matte creamy beige which makes the perfect brow bone highlight. Salted Caramel is a matte very warm toned light brown which I have been using as my transition colour every time I use this palette. Marzipan is a pinky peach shade with a satin finish. This shadow is very pigmented and gives off a beautiful sheen when used on the lids or in the inner corner. Semi-Sweet is a warm toned medium matte shade. Hazelnut is a satin warm toned medium brown with a golden sheen. Crème Brulee is a muted gold with a satin finish. I thought this shade might be comparable to Urban Decay Half Baked, however is is more muted in colour, Half Baked is a lot brighter. Haute Chocolate is a medium warm brown with a bronze sheen. Milk Chocolate is a neutral/warm toned matte light brown. This is another great transition colour if you do not want to use a colour as warm as Salted Caramel in your crease. Black Forest Truffle is a purple/brown with silver shimmers. Like Gilded Ganache the shimmers stick to the skin really well. Triple Fudge is a matte cool toned dark brown. This makes a great liner if you want to something subtle. Strawberry Bon Bon is a light matte baby pink. Candied Violet is a cool toned medium purple with silvery purple shimmers. Amaretto is a medium warm toned rusty brown with a satin finish. Cherry Cordial is a matte warm toned plum brown. I loved using this on my lower lash line and smoking it out. Champagne Truffle is a very light pinky champagne with a frosty finish. I have been using this on my inner corner to brighten my eyes and it looks lovely. You get 16 eyeshadows in this palette for £45, thats approximately £2.80 each, which is such great value for money. 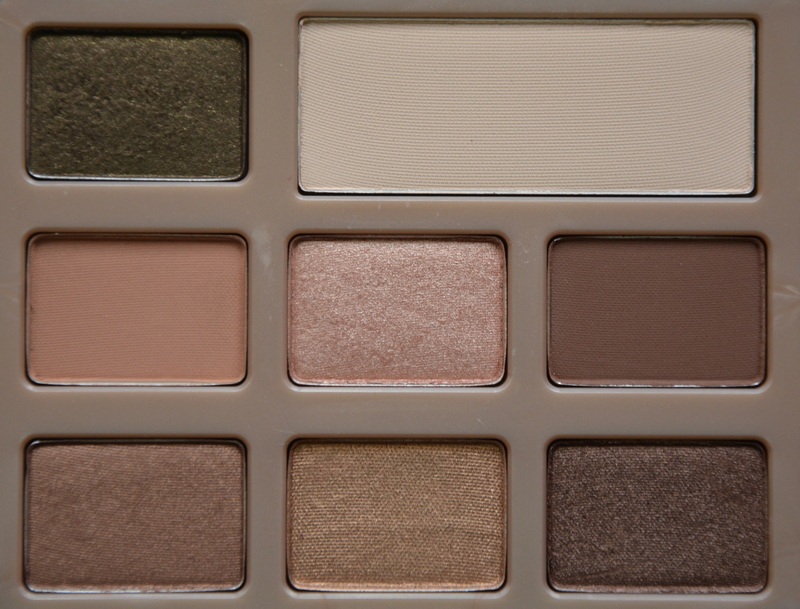 I think if I had to choose one neutral palette from my collection this would be the one I chose. I prefer it over all of my naked palettes due to the inclusion of some purple and plummy shades. It is nice to be able to add some subtle colour into a neutral look. The only change I would make is to change the colours of the two larger shadows. I would have preferred for Salted Caramel and Milk Chocolate to be the biggest as they are the colours I use the most of. 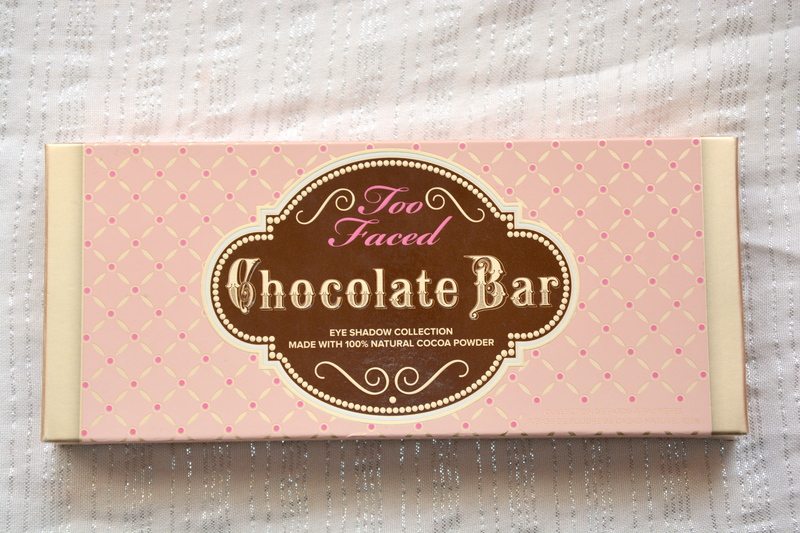 Too Faced Chocolate Bar Palette retails for £39 and is available from Beauty Bay, Look Fantastic and Debenhams. It is currently on sale for £35.10 on Debenhams website. P.S. 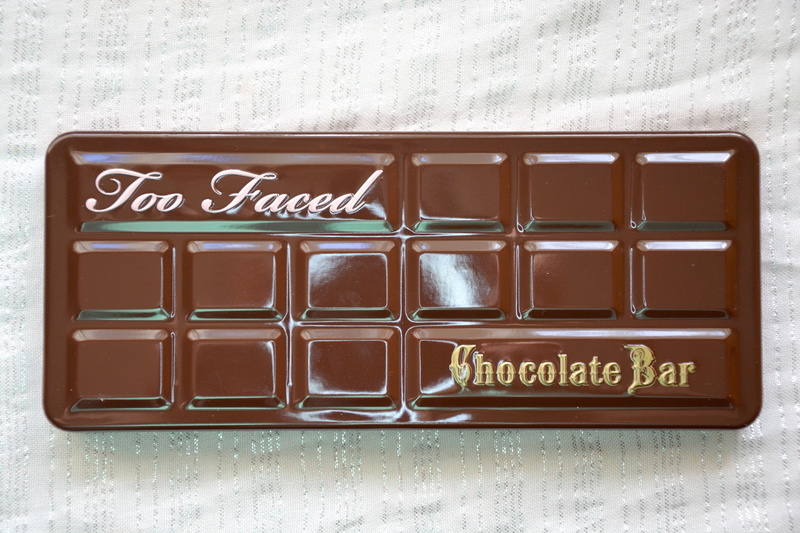 I have heard mumblings of a second Chocolate Bar palette from Too Faced. I will definitely be keeping an eye out for that.